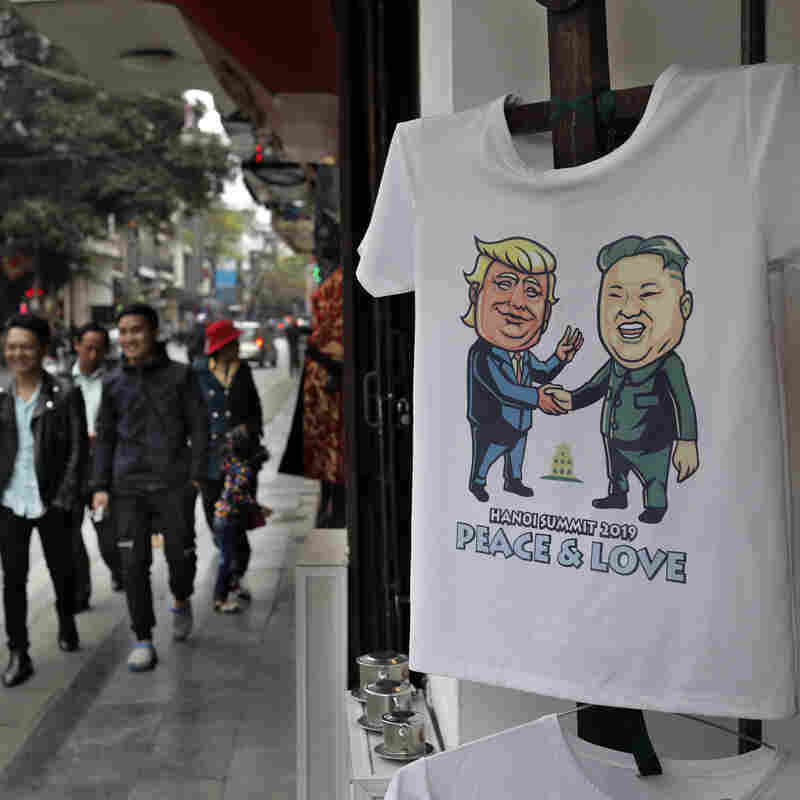 Trump-Kim Summit In Hanoi Has Vendors Cashing In On Kitsch Playing host to the second summit between President Trump and North Korean leader Kim Jong Un, people in the Vietnamese capital are having fun with everything from T-shirts to parody haircuts. 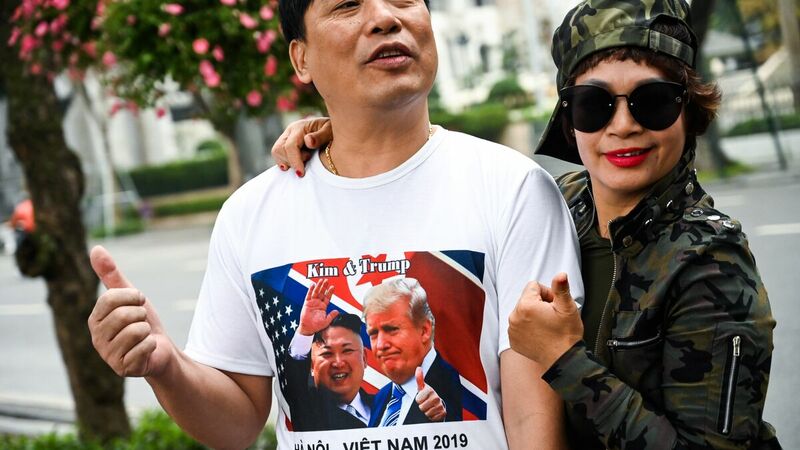 A man wearing a T-shirt featuring pictures of President Trump and North Korean leader Kim Jong Un poses near the Sofitel Legend Metropole hotel in Hanoi on Wednesday. Despite snarled traffic and security cordons, residents of Hanoi have gamely stepped into their role as hosts for the second Trump-Kim summit, and businesses have cashed in on the event with parodic products, from food to haircuts. "I believe that this summit will be better than the last one in Singapore," declares 56-year-old T-shirt merchant Truong Thanh Duc. He adds: "And this summit will bring peace to the world. No more nuclear war." His street-side stall in downtown Hanoi is hung with shirts decorated with a beaming Donald Trump and an impassive Kim Jong Un, above the words "Peace Hanoi Vietnam 2019." Other garments celebrate a famous Vietnamese rice noodle dish and are emblazoned with logos such as Pho Real, What the Pho and iPho. 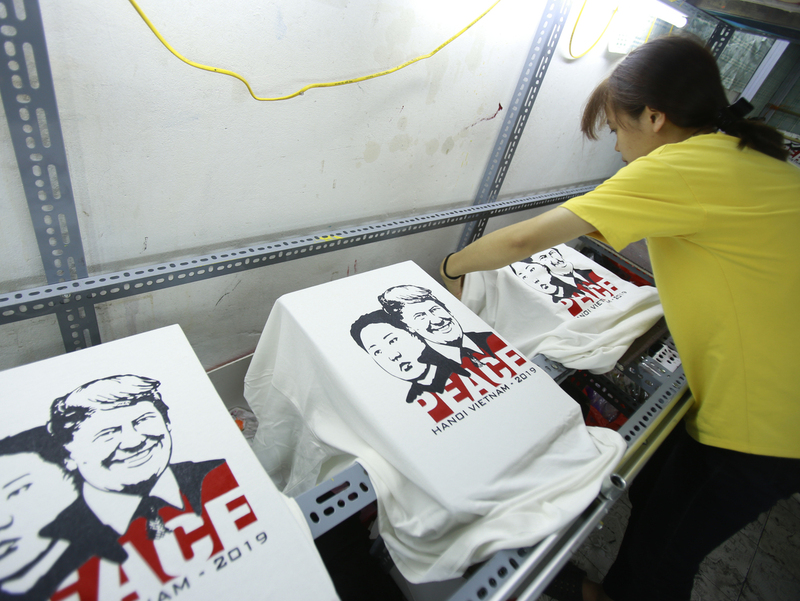 A worker removes T-shirts printed with portraits of President Trump and North Korean leader Kim Jong Un at a custom T-shirt shop in Hanoi last week. Truong has set out a basket of free bread and water to feed the customers and crowds of tourists passing by his stall. Elsewhere in the city, commuters waited at an intersection as a black Mercedes Benz limousine with North Korean flags cruised past. As soon as the motorcade was gone, swarms of motorcycles surged forward, creating massive gridlock. Some barber shops are offering haircuts reminiscent of Kim's and Trump's. Others are shaving their visages onto the back of customers' noggins. Hanoi restaurants and bakeries, meanwhile, peddle cupcakes, burgers and pizzas adorned with the two men's images. Vietnam's experience as a former wartime adversary of the U.S., which later mended fences with the U.S. and prospered economically, has been at the center of Trump's message to Kim at the summit. "I think that your country has tremendous economic potential. Unbelievable. Unlimited," Trump told Kim, before the two men went for dinner at the French colonial-era Metropole Hotel. "And I think," he added, "that you will have a tremendous future with your country — a great leader. And I look forward to watching it happen and helping it to happen." As Vietnam's capital gears up for the second summit between Trump and Kim, people are buying up off-beat souvenirs. These matters are clearly on the mind of Tran That Thang, who has brought his young grandson to the Vietnam Military History Museum in downtown Hanoi, across the street from a statue of Russian revolutionary Vladimir Lenin. Tran, accompanied by his wife, takes the young child past the remains of a downed U.S. B-52 bomber, a UH-1 "Huey" helicopter, and rows of unexploded American bombs and landmines. "In order for my family to visit here today, we have gone through many years of fighting," says Tran, who was a soldier in the North Vietnamese army from 1972-75. "It will help people to understand the true value of peace. It's a solemn and meaningful thing for every family," he said. Tran adds: "Now the U.S. and North Korea have chosen Hanoi for their summit to work for world peace, which is what we all want." He walks past a fighter plane shot down at Dien Bien Phu in 1954. That decisive defeat for the French, who preceded the Americans in Vietnam, marked the end of their colonial presence in Indochina. Tran, it happens, was born that year, the son of a North Vietnamese soldier. His father gave him his name, which means "will be victorious."